Revo SuperSignal review | What Hi-Fi? It’s been nearly four years since a Revo product received anything less than a five-star review from us – and the SuperConnect radio (a bigger sibling of the SuperSignal we’re reviewing here) won an Award at the end of last year. Revo is clearly on something of a roll, so the pressure’s on the SuperSignal to retain the family honour. If the SuperSignal is to besmirch the Revo name it won’t be on the basis of specification – it’s absolutely on the money for a product of this type. DAB, DAB+ and FM radio reception, aptX Bluetooth streaming capability and auxiliary inputs (stereo RCA and 3.5mm) constitute the sources, 10W of Class-D amplification provides the oomph and a 3.5in flat diaphragm driver (reinforced by a downward-firing reflex port in the bottom of the cabinet) delivers the sound. There’s a bright, crisp OLED display to keep you informed, a very acceptable remote control if the responsive little joystick control on the fascia is too much of a faff, and alarm functions in case you want to position the SuperSignal next to your bed. Neither is it found wanting in terms of build quality, finish or interior décor cachet. Between the cabinet options (matt or gloss black, matt or gloss white, or walnut) and grille finish (anodised aluminium in silver – unless you select a walnut cabinet, in which case you can choose silver or black) there’s a winning degree of modern retro chic on display here. The finish is smooth, ergonomics are simple and logical, and the controls feel nicely judged. So far so covetable, then. But a £200-ish radio stands or falls on the quality of the sound it makes – and if we had to pick a single word to describe the sound of the SuperSignal, we’d probably go with ‘rich’. For the sake of the big picture, though, we’re going to use a few more. It’s a large-scale sound the Revo produces and, given the brevity of the cabinet from which it emerges, its ability to fill a medium-sized room is not to be understated. Dispersion from the single driver is convincingly wide, and there are sufficient reserves of power to allow the more dynamic broadcasts (usually Radio 3 in our experience) all the headroom they need. There’s frankly unlikely heft to low frequencies, nicely judged bite at the top end and an understandable tendency to push the midrange slightly forward in-between. Both DAB and FM reception is sturdy, even in the depths of our (metaphorically) lead-lined listening rooms. The Revo identifies and grants access to an impressive number of stations, and clings tenaciously to the signal once you’ve made your selection. Talk radio stations like the BBC’s 5Live or the shouty TalkSport have ample clarity and the detail to make voices crystal clear. Reasonably high-quality DAB music broadcasts (6Music or Classic FM, say) are nuanced and expressive, with a degree of spaciousness and, again, scale that’s at odds with the physical size of the SuperSignal. Switch to music streamed via an aptX Bluetooth-enabled device and these traits are carried over. There’s considerably more gusto to an aptX file than to a DAB transmission – once through New Order’s Bizarre Love Triangle via the splendid LG G5 smartphone reveals the additional dynamism and detail retrieval of which the Revo, given an appropriate source, is capable. Low frequencies are, unarguably, absolutely as rich and luxurious as they want to be, but the SuperSignal remains balanced, poised and times well. 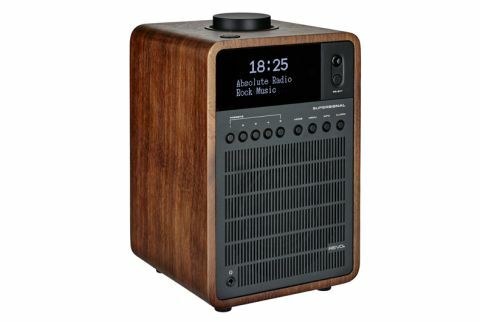 Those who prefer a sleeker, more streamlined and less muscle-bound sound are well served by Ruark’s splendid R1 Mk3 (£199) a product to which the Revo, visually at least, owes more than a little. But if the quart-in-a-pint-pot scale and heft of the SuperSignal appeals, there’s really no reason not to give it an audition.